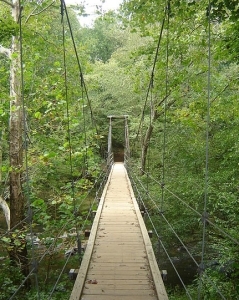 Archaeology tells us that men first walked trails along the Eno long before recorded history. Indians of the Eno, Shakori, and Occoneechee tribes lived along the river when the first European explorers passed through. Some of the tribes merged in the late 17th century and established a village near present day Durham. Settlers moved in during the mid 1700's to set up farms and gristmills. More than 30 mills were located along the length of the Eno. Efforts to establish Eno River State Park started in 1965, when the city of Durham proposed building a reservoir in the river valley. A group of concerned citizens led a campaign to save the Eno and formed the Association for the Preservation of the Eno River Valley. Under the leadership of Durham teacher, social worker and environmentalist Margaret Nygard, the Association worked with The Nature Conservancy to develop a partnership with the City of Durham, Orange County and the State that culminated in the creation of the state park in 1973. The Association partnered with The Nature Conservancy in 1972 and the organization received its first donation of land that year -- 90 acres -- from Mary and Frederick Bernheim. The association proposed a state park be established and, in May of 1972, the state of North Carolina approved the idea. The city of Durham withdrew its efforts to construct the reservoir and in 1975 the state opened the park with more than 1,000 acres of land. Following the establishment of the park, the Eno River Association continued fundraising and conservation campaigns, including the annual Festival for the Eno, that have led to sustained awareness of protecting the river corridor as well as purchase of additional lands for the state park. Today the park encompasses more than 4,000 acres along 35 miles of its course through Orange and Durham Counties. North Carolina Division of Parks and Recreation. Eno River State Park Master Plan. 1979. https://archive.org/details/enoriverstatepar00unse (accessed September 19, 2015). North Carolina Division of Parks and Recreation. [Eno River scene.] Photograph. ca. 1979. From Eno River State Park Master Plan. https://archive.org/details/enoriverstatepar00unse (accessed September 19, 2015). Zanter. "Eno Park Footbridge." 2006. Wikimedia Commons. https://en.wikipedia.org/wiki/File:Eno_Park_Footbridge.jpg (accessed September 19, 2015).